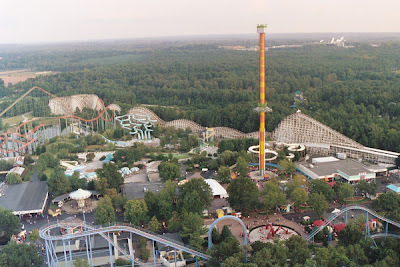 Located an hour apart are two major amusement parks--Kings Dominion, just north of Richmond, Virginia and Busch Gardens in Williamsburg, Virginia. Despite being in close proximity, these amusement parks are very different. 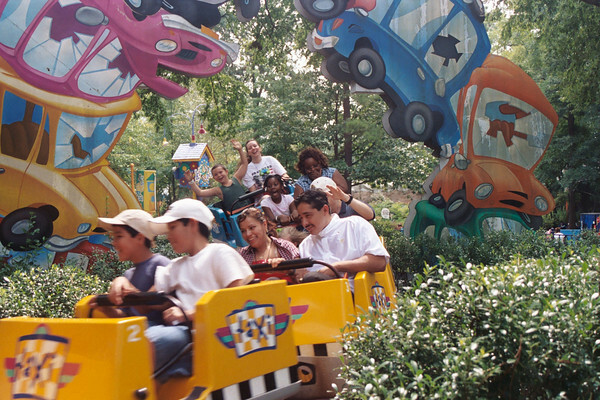 Kings Dominion has a massive number of children and family rides, close to 30--especially all things wheels including cars, trucks, jeeps, bumper cars, and driving school rides. It has two kiddie roller coasters (and several more intermediate ones) and boasts a splash playground, perfect for hotter days. There is plenty of shade and lines are short in the kiddie area. There are enough rides to last for hours. And children under 3 are free. Family rides are more spread throughout the park including a must see 4D Spongebob movie, log flume ride, a laser blaster ride, dinosaur exhibit and more. Use this time to let little ones sleep in the stroller while your older children participate. Adults and teens will love the thrill rides with 11 coasters (including an indoor black coaster), a canyon rapids ride, a drop tower, and rides that spin and spin, there really is too much to see and do in a single day. And don't forget the water park. With plenty of slides, a wave pool, splash pad for the little ones, and beach chairs, this is a great place to relax, cool off, and people watch. Tweens that do not care for thrill rides, will find this the best part of the park. If you live close enough, the season pass is an incredible bargain--especially since the park is open in the spring and fall. Otherwise, look for discounts or buy online. Busch Gardens is a completely different experience. Built on a unified European theme, the look and feel of Busch Gardens is more Disneyana and less like a traditional amusement park. The shops offer a European feel with plenty of beer (this is Busch Gardens). Two children areas are offered--Sesame Street Forest of Friends and Land of the Dragon. They are located in separate parts of the park and are smaller than their Kings Dominion counterparts. Busch Gardens offers several kiddie classics including a kiddie coaster, a kiddie log flume, and both wet and dry play areas. The major difference is the presence of Sesame Street characters. For children who live to see Elmo or Cookie Monster, Busch Gardens is the definitive choice. But for children who have grown out of Sesame Street, Kings Dominion is the better option. For Adults and Teens, Busch Gardens offers several excellent roller coasters including Apollo's Chariot--a hyper coaster and the Alpengeist. Lines might be long, but for additional fee, guests can buy a quick queue pass. The real star of Busch Gardens is the animal attractions and shows. Though the shows rotate, their usually is a 3D movie, a family show involving amazing pet stunts, and one with a celtic flair (often Irish dancing). For families that enjoy more shows and fewer rides or simply need a break from long lines and hot days, Busch Gardens will not disappoint. The one drawback is that Busch Gardens does not include a water park. Water Country USA is affiliated with Busch Gardens but is a drive (not walk) away and is a separate fee. Though an excellent water park in its own right, it is a separate experience and cost. In my opinion, Kings Dominion wins this round. For locals, the choice is obvious-- season passes are inexpensive and Kings Dominion offers a wide variety of attractions in one location. For the tourist, Kings Dominion is still the better choice with cheaper tickets and an inexhaustible list of rides, not to mention a water park. So spend a day at Kings Dominion especially if you are visiting historic sites like Williamsburg or Washington DC and need a day of fun. What a great amusement park indeed. I'd love to visit that place as well.